Harri TatnellA former Cardiff High School pupil graduates from Bangor University this week, having embraced the vast array of opportunities available. Harri Tatnell, 21, from Penylan, Cardiff graduated with a BMedSci Medical Sciences degree after three years of hard work and dedication. Harri said: “I am really excited to be graduating. Although, I have thoroughly enjoyed my student experience at Bangor, it has gone way too quick – I would love to do it all over again! I am passionate about university experience and opportunities and I believe everyone should consider high education. 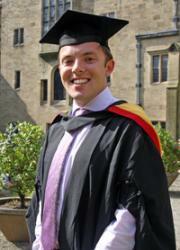 “As a Welsh student, I felt it was important to study in Wales. I wanted to move away from home and from the first open day at Bangor, I was immediately captured by the amazing location and opportunities. “During my studies I worked as a Campus Life Coordinator within Halls of Residence. The Campus Life Coordinator role and the Campus Life programme aims to ensure students enjoy their time in halls and to promote an inclusive residence community. Through the role, I had the opportunity to meet and engage with so many different people. I thoroughly enjoyed working with my fellow Campus Life Coordinators and the Residential Life team, and I have gained many valuable transferable skills. “Although Bangor is a relatively small city, it has many employment opportunities. I worked regularly with the University’s marketing department, and helped out at many open days and travelled across England and Wales to help with UCAS higher education fairs. This role has helped me to improve my confidence in public speaking as well as meeting lots of new people and importantly, getting them thinking about university.